We've got you in Our House hands! WE UNDERSTAND THAT AS A HOMEOWNER IT IS HARD TO KNOW WHO TO TRUST WITH YOUR HOME. Our priority is to earn that trust. No disappearing acts, no industry jargon. Just open communication from the first stages of planning, through construction, until your home project is complete. We listen to your needs and match them with your budget. Your experience matters as much as the final result. Let’s face it, roofing your house is a serious matter, not only because is a long-term investment but it can be the costliest single improvement to your home. This subject is one of our specialty. Learn more! The right siding can dramatically boost your home. Are you thinking to upgrade your house? This could be a good option to start with. Let us help! Gutters are a very important part of your roofing system. Many people can think this is not significant at all. Let us help you choose the proper roof drainage system. Our House Restoration is a full service residential roofing company dedicated to providing customers with the highest standard of service and workmanship. As a trusted, Full Service restoration company, Our House Restoration offers top-notch, but affordable residential and commercial contracting services. Our home exterior specialists can repair hail damage, fire or water loss too, as well as wind and rain damage. We will work directly with your insurance company to help get your roof replaced or repaired. 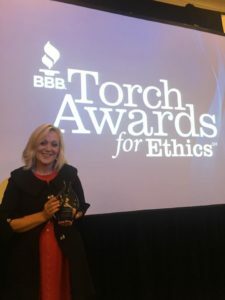 Tami Hartley – Owner, Our House Restoration, Inc.
Our passion and drive to help homeowners with their restoration needs and build relationships with honesty, integrity and credibility helped us win the Better Business Bureau 2017 Torch Award for Marketplace Ethics as a small business. View the award announcement. No worries, We’ve you in OUR HOUSE hands. 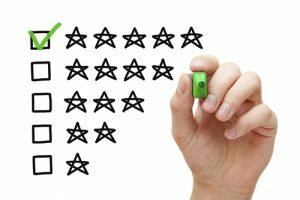 We understand that as a homeowner it is hard to know who to trust with your home. Our priority is to earn that trust. We were given a recommendation our insurance agent to use Our House Restoration to get our roof replaced. 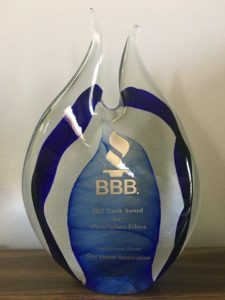 I called Tami Hartley of Our House Restoration along with several other companies. We choose Our House Restoration because Tami was dedicated to helping me with my insurance claim and….READ MORE!